WeCraftCards.com • View topic - Friday Challenge: Tri-fold shutter card!- Winner is Elaine! 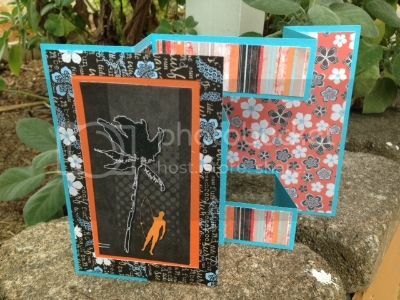 Friday Challenge: Tri-fold shutter card!- Winner is Elaine! This was actually quite fun (also the Silhouette already had a template for a tri-fold shutter card so for me this was actually easy as I let the machine do all the measuring, cutting). All I had to do was decide on the paper and I went with the Tahiti paper stack that I have had in my stash for ages! Fun thing with this design is that the front piece is a 4 x 6 rectangle placed on top of the shutter so that it folds flat. I wanted the blue cardstock to show more prominently so I cut the image paper and the floral paper down just a bit. The orange, blue, black and white really set this card off, and I like it. Barry, I love that color combo. And, that you let the Silhouette do most of the work. Golda - I know many guys that would love to receive your off-roading card! Great theme. Golda, I agree with Trudi, someone is gonna love getting your card! Last edited by MrsAsperin-Kathy on Mon Aug 29, 2016 9:07 am, edited 1 time in total. Barry, your shudder card is pure delight! I love the way the colors pop. Golda, any guy would love to receive your manly card; great papers! Golda, another fun card from you. Too cute! Thanks to all of you for participating in this challenge... even though it might have made you shudder!! The winner of my challenge is Elaine! Kathy, thank you for the fun grab bag prize! It will be a breeze to make some shutter/shudder cards with the bases you provided! Your colored owls are beautiful and love the assortment of interesting papers you sent. I already have plans for the brick paper! Thank you for the great challenge and the awesome prize! eoconnell wrote: Kathy, thank you for the fun grab bag prize! It will be a breeze to make some shutter/shudder cards with the bases you provided! Your colored owls are beautiful and love the assortment of interesting papers you sent. I already have plans for the brick paper! Thank you for the great challenge and the awesome prize! Glad you liked the assorted items. I remember that you liked the owls from a past challenge. Enjoy!